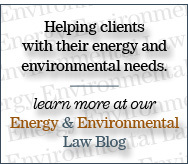 Our team of energy and utilities lawyers is one of the largest and most experienced in the Midwest. We counsel clients in all segments of the energy industry – crude oil and natural gas producers, service companies, gas marketers, large and small energy consumers, alternative energy producers such as wind farms and biomass and ethanol facilities, and independent electric power producers and marketers. Our trial lawyers routinely represent clients in state and federal courts, administrative proceedings and arbitrations involving energy issues. We have extensive experience litigating disputes involving electric deregulation, electric supply and marketing contracts, oil and gas lease royalty claims, drilling and operating agreements, gas purchase contracts, personal injury and wrongful death claims, and product liability issues. In addition, we regularly represent oil and gas clients in lien and collection matters, reorganizations, receiverships and bankruptcies. Vorys attorneys have long been leaders in professional organizations in the energy field. Our firm is a charter member of the Energy & Mineral Law Foundation and a long-standing member of the Rocky Mountain Mineral Law Foundation. Our lawyers also have held executive positions with the leading trade organizations in the oil and gas industry both nationally and in the Appalachian Basin, including the Independent Petroleum Association of America (IPAA) and the Ohio Oil and Gas Association. For years, Vorys attorneys have actively participated in the Ohio State Bar Association Natural Resource Committee, including serving as chair on five different occasions. In Pennsylvania, our attorneys have been active in the Marcellus Shale Coalition, Pennsylvania Independent Oil and Gas Association, Michael Late Benedum Chapter of the American Association of Professional Landmen (AAPL) and the Northern Appalachian Landman's Association Chapter of the AAPL.